Order Imprinted Custom Nylon Lanyards from Colorado Promotion today for your next event, fundraiser, community gathering, school organization, and more. These comfy nylon lanyards are perfect for tradeshows, festivals, schools, etc. These Lanyards are 3/8 inch but if you require something else, just ask! 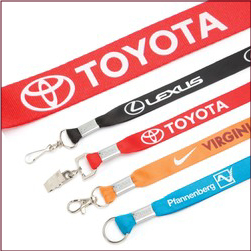 We offer hundreds of types of lanyards and more. – Colorado Promotion.